This is my ultimate favorite Flourless chocolate cake. It is just perfection. What can I say about this flourless chocolate cake recipe? You need to make this one and do yourself a favor it is that good. If you are an avid chocolate lover, like I am, you will love this cake. When I made this Flourless chocolate cake I wasn’t thinking too much of it but when I actually had the first bite, holly smokes came to mind. My husband, my sister and everyone that had a piece pretty much-loved this cake. My sister thought I actually bought the cake. Not quite. She couldn’t believe it didn’t have flour in it. If at any point there is a gathering in the future that I will be attending, this is the cake I will be bringing. 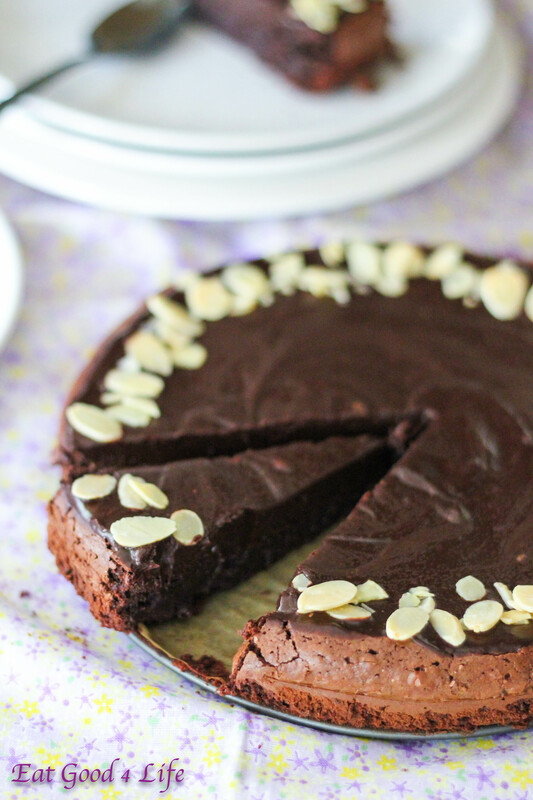 Quite frankly, this chocolate cake is super easy to make and just exquisite to the palate. This flourless chocolate cake goes a long way. 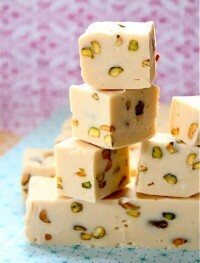 A little piece is just sufficient to satisfy your taste buds. This is the ultimate chocolate flavored cake. I really could go on and on about it but really you just need to try it for yourself. Use the best quality cocoa powder you can find. I use this kind. It is the only one I use from now on. 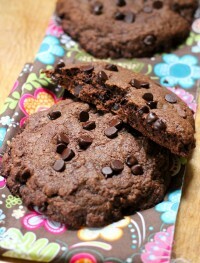 Use the best quality chocolate chips you can find making sure that cocoa, and not sugar, is the main ingredient. Don’t be afraid of the olive oil in this. You can not taste it at all and is better than using butter, less saturated fat and more of the good fats like polysaturated and monosaturated ones. On another note, I have just gotten my new Dutch oven 6 quart pan and I am so ecstatic about it. 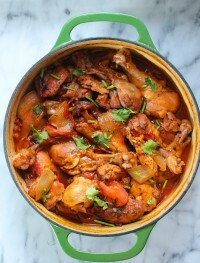 I can’t wait to make some stews and share the recipes with you. I really love this piece of equipment. Anyhow, I hope you get to make this Flourless chocolate cake. It is sensational, delicious, exquisite and out of this world. Here you can see how the batter looked like before and after adding the melted chocolate. I worked with a hand mixer before adding the chocolate to whip the eggs and sugar for about two minutes and used a spatula to combine the chocolate with the egg batter afterwords. The mixture will be sort of fudgy and dense. Preheat oven to 325F. Lightly grease an 8″ round springform cake pan. Cut a piece of unbleached parchment paper and grease it. Lay it in the bottom of the pan. Put the chocolate and olive oil in a microwave-safe bowl, and heat until the chips are soft. Stir until the chips melt, reheating briefly if necessary. Set aside. In a mixing bowl, with a hand mixer, combine the eggs, sugar, salt, espresso powder, and vanilla. 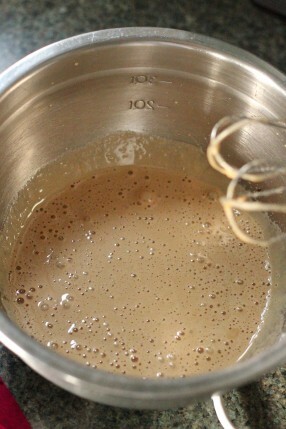 Beat on medium high speed until the mixture is very foamy, pale in color, and doubled in volume, 2 minutes. 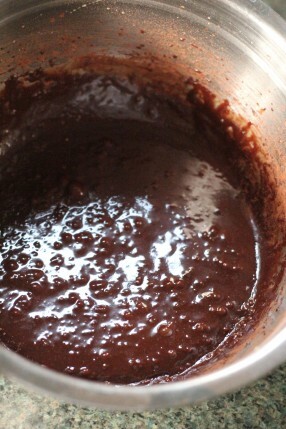 Reduce the mixer speed to low and gradually pour in the chocolate mixture. Continue beating until well blended. Add the cocoa powder and combine until it is well incorporated. Pour the batter into the prepared pan and bake for 35-40 minutes until the top will have formed a thin crust. I baked mine for 35 minutes. Remove it from the oven, and cool it in the pan for 5 minutes. Carefully run a small knife around the edge of the pan to loosen the cake. Remove the pan and parchment and let the cake cool completely. The edges will crumble a bit, which is fine. Allow the cake to cool completely before glazing. To make the ganache, combine the chocolate and cream in a microwave-safe bowl, and heat until the cream is very hot, but not simmering. Remove from the microwave, and stir until the chocolate melts and the mixture is completely smooth.Spoon the glaze over the cake and decorate as desired. I used some raw sliced almonds. Allow the glaze to set before serving the cake. 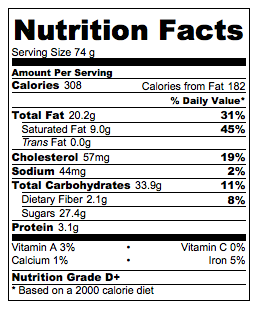 Nutrition facts calculated based on the recipe giving 10 servings. It looks amazing!! But what’s “Pumpkin Spice”? Can I do it at home? And the apple sauce, is it possible to do at home? Is it like a puree? Yes apple sauce is like apple puree. Pumpkin spice is a mixture of spices consisting of cinnamon, cloves, nutmeg and ginger. 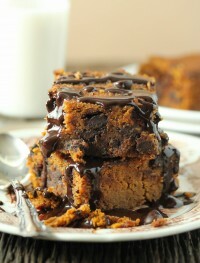 Oh my god this pumpkin and chocolate cake looks delicious. 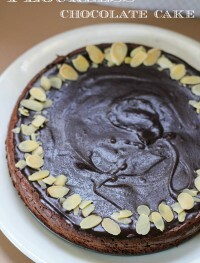 Especially loving that thick drizzle of chocolate over the top.. Pinned! Made these tonight! I substituted the olive oil for coconut oil. Followed directions to a T, but they came out really mushy inside. I even cooked them longer than the recommended time. Oh no, I am so sorry. Mine were a bit crumbly but not mushy. I wonder what when wrong :-( I might have to make this recipe again and see. So sorry it did not turn out for you!! What do you think would happen if I left the sugar out? Could I replace it with something else? Just a thought. 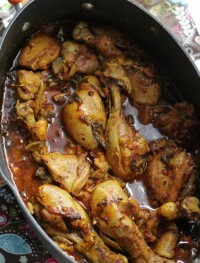 Thanks for this yummy looking recipe. Looks absolutely gorgeous Miryam. Does this taste olive oily at all? Do you use regular or extra virgin? 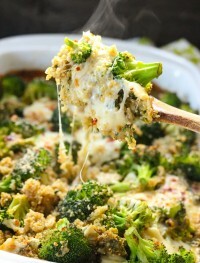 Can this recipe be made vegan with flax eggs? Has anyone tried to make this with a GF all purpose flour blend or almond flour? I’d prefer to not buy coconut flour for one recipe. I think it would work fine w/ GF free flour however you will need more since coconut flour absorbs a lot of liquid and behaves differently. Let me know how it turns out!! 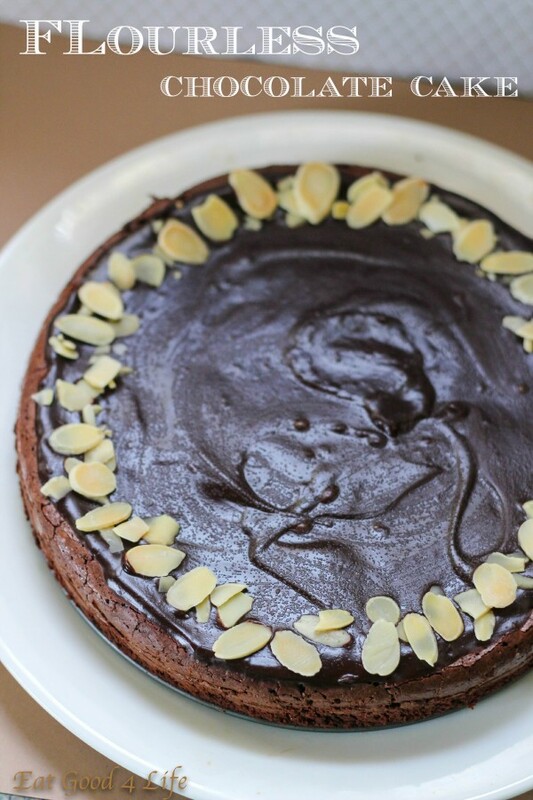 This cake was amazing….I used GF flour mix..and chocolate almond milk. It was absolutely delicious and so moist. Ok I really don’t know why is not turning out for some people. I am going to have to do this again and see what the problem is :-( So sorry!! I am experimenting w/ the recipe again soon. It is turning for some people and not for others…so weird!! I am going to try and make them again too. Although they turned out extreme moist, they were still delicious! Sue Callison ~ When you made this cake with GF flour how much flour did you use? i just made the recipe, but i always have the same trouble when i make a coconut flour recipe, it kinda breaks down ..a lot. but oh well i’ll put it in the fridge and wait for tomorrow and see how it turns. thank you for your amazing recipes!. What could I use to replace the eggs? Has anyone tried replacing the eggs? I made this cake with the recipe listed and it turned out delicious and moist. I made sure that there were little to no clumps of coconut flour left when I mixing. I think that is key. Thanks for letting me know. I am glad you liked it :-) Thanks for stopping by. I am dying for this cake!!!! 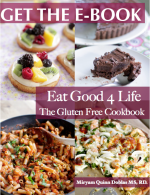 My husband has food allergies…dairy, soy, wheat, egg, flax etc…so baking is challenging! I subbed the coconut flour for 1 1/4cup trader joes gluten free flour, egg replacer for eggs. I melted safe chocolate chips and mixed with powder sugar and almond milk to make a thick gooey frosting! OMG! Best ever! We wanted to just sit at the table with 2 forks and eat it right out of the pan! Thanks!!! Love!!! That is awesome. I am glad you liked it. I have another chocolate avocado cake that is also best after cooling in the fridge rather than a room temperature so I am glad you liked it in the end. Thanks for stopping by. I made this cake tonight and the only substitution I made was pure maple syrup for sugar. (I also cut it back to 1/3 cup since that is all I had left!) I baked it 50 minutes and it was moiste but not falling apart. My three year old loved it even without the drizzle. He said it was “tasty!” A lifesaver for me since I’m trying to avoid grains and really needed a sweet treat! Thank you! That is awesome. I am glad you liked it :-) You made it even healthier w/out the extra sugar! Do you think you could use an all purpose flour in this recipe instead? If so, how much would you use?! Thanks!! You could use all purpose flour however I don’t know home much the recipe would require since this type of flour behaves completely different than coconut flour and it is not a 1:1 ratio. I would say at least 1 1/4 cups but perhaps more!! 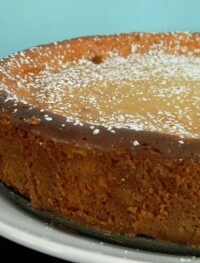 I made this some time ago, and while it was delicious, the consistency was more like pumpkin pie than cake. I used E. D. Smith’s pumpkin puree from the tin, which, for a couple other recipes I tried (not from your site), didn’t turn out well, and I wonder if some pumpkin is just more moist than others, hence the difference in the results. No worries. I wish I would have had a shot of the bater…trust me I regret that. When ever I make it again I sure will add the picture! Thanks for stopping by. You can include the picture but not the recipe. 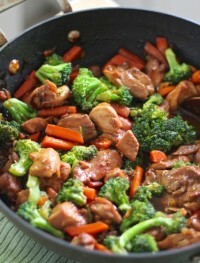 You can place a link in your post linking to my blog where the recipe resides for SEO purposes. It is not good to have duplicate content. Thanks for asking! I just made the recipe tonight and the only changes I’ve made, based on previous comments, is that I substituted the olive oil with coconut oil and used 1 1/4 cups of Gluten Free flower instead of coconut flour. It came out of the oven after 50 minutes perfectly! We all enjoyed it a lot and this is a keeper! Can you sub another kind of flour for the coconut flour? 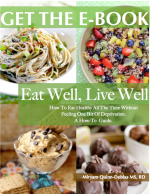 What can I substituted the unrefined sugar for? Regular sugar, stevia? And if so how much? Thanks! Thanks! I used coconut palm sugar. I swapped the olive oil for coconut oil and it turned out like a cross between a pumpkin pie texture and cake. Def not a traditional fluffy cake. I took a previous comment about serving cold and it was much better cold! It could have been a little sweeter. Maybe I’ll add more sugar next time! 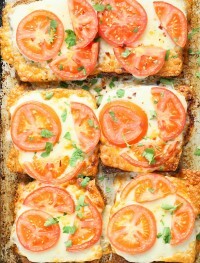 I’m trying this recipe out right now! I substituted banana puree for apple sauce, so I hope that works out okay. I’m also baking it in loaf form rather than a cake pan, since I don’t have the right size cake pan. I hope it turns out! This looks like heaven! The perfect flavor combination of chocolate chips and pumpkin, yum.